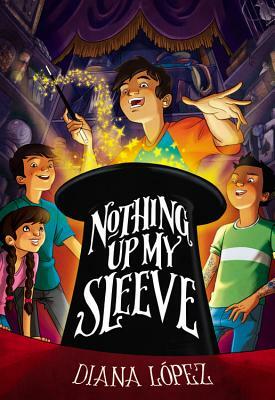 Today we’re very pleased to host a dialogue with Diana López in honor of her newest middle grades novel, Nothing Up My Sleeve, which released on April 19. This book follows three friends – Dominic, Loop, and Z – as they discover the exciting world of stage magic one summer. 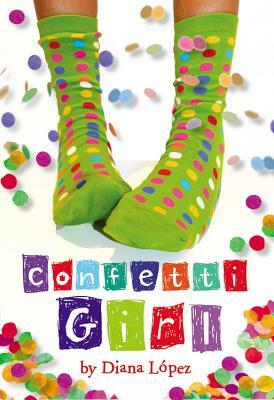 It’s equal parts humor, character study, and magic lessons – a fun and fascinating read. After finishing Nothing Up My Sleeve (click here for our book review), I was definitely curious about Diana’s creative process, so I’m very grateful that she was able to answer these questions for me. Enjoy! I love the backdrop of stage magic in Nothing Up My Sleeve. What inspired you to explore this topic? My husband, Gene, inspired me. I wouldn’t know the first thing about magic if it weren’t for him. He’s an aficionado with a great collection of magic books, props, and videos. Over the years, I’ve been a tagalong at magic lectures and conventions, including the TAOM convention that I write about. Magicians are so creative, and if you think about a magic performance, you’ll realize that it’s just another form of storytelling. How could I resist? I had to write this book! And I had so much fun finding magic tricks that resonated with the characters’ personal lives. This is what stories do—give us tools for coping and for celebrating life. Another important source of inspiration comes from my nephews who turn absolutely everything into a competition. Think about it. Competitions are wonderful for writers because they have a built-in sense of conflict—you’re “fighting” against others but you’re also fighting against yourself as you work to problem-solve or overcome insecurities. In a sense, a competition is a form of story, too. Also, could you describe your process in creating this book? I carry a little notebook around and jot down bits of dialogue or names of interesting things. I sometimes take pictures, too. Anything that feels like a good detail for a story. The magic shop, Conjuring Cats, is completely inspired by JCR Magic in San Antonio, for example. Eventually, I realized that I wanted to write about three boys at a magic competition. But who were they? What kind of magic did they do? What else were they dealing with? To find out, I had to do a lot of exploratory writing, stuff that never gets into the final novel. It’s my way of searching for voices. And with three boys, I needed three voices that were distinct. Once I had the voice and general sense of where the book was going, I started drafting. I’m not an outliner. I prefer to write, rewrite, rewrite, and rewrite. Stuff gets moved around, deleted, added, and the story eventually works itself out. I know it’s not the most efficient way to write, but for me, it’s the most enjoyable. What made you decide to use three narratives? How did you go about developing Dominic, Loop and Z? My previous books follow one character, so using three narratives was a new experience for me. From the beginning, however, it felt like the best approach for this novel. I love competitions—sports, board games, reality shows like Survivor or Amazing Race. It’s fun to root for someone, but often, I find myself rooting for more than one person. Something similar happened when writing this book. I found myself rooting for all three boys, so I wanted to give each of them time on the stage. Using three perspectives also gave me a chance to explore how different people learn a new skill and perform in front of audiences. I love the unique set of abilities and insecurities that accompany each character. One of my favorite experiences with this book was taking a classic sleight, like the French drop, and seeing how the boys used their personalities to create different versions of this one move. As for developing the characters, Dominic, Loop, and Z are very loosely based on three of my nephews. I love to eavesdrop on their conversations, and I’ve had plenty of chances to witness how they fight and how they show affection. Writers harvest ideas and voices from their environment, and that’s exactly what I did. I even called my nephews when I was looking for creative insults like “Fungus Foot, Toilet Clogger, Slobber Boy, and Stink Bomb.” Yup, they get total credit for that. 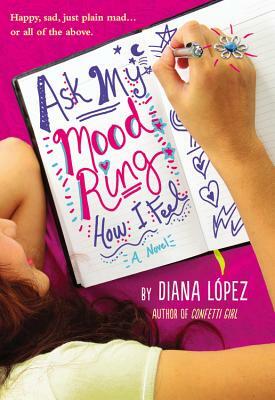 What do you want readers to carry away from Nothing Up My Sleeve and your other middle-grades books, Confetti Girl, Ask My Mood Ring How I Feel, and Choke? I want them to enjoy the books. Just have fun. It breaks my heart to hear young people (or anyone) complain that books are boring. If I can make people laugh or nod because they recognize a bit of themselves in the story, then I have done my job. For readers who like to dig a little deeper, I’ve posted some discussion guides on my website. You can find them on the “classroom” page http://www.dianalopezbooks.com/classroom.php . Find a friend and have a book chat. Published books don’t belong to the authors anymore. They belong to the readers. As an author and creative writing professor, you clearly know a thing or two about writing. What kind of advice would you like to give to aspiring young writers out there – especially writers who want to publish books that celebrate diverse experiences and perspectives? Aspiring writers are probably tired of hearing this, but it bears repeating because it’s so true. The best way to improve your writing is to read, read, read. And if you’re interested in celebrating diverse perspectives, then buy those titles. Do a little research to discover writers from your community, and then support them. We need to let publishers know that there’s a real interest in these books. The second bit of advice is to pay attention to the world around you. Just read the signs, watch the people at parks or malls, browse the aisles at grocery stores. Examine familiar places as if seeing them for the first time. The diversity is built-in, and these are the details you want to capture in your books. Since you published your first book, have you seen a change in the quality/quantity of diverse books published? Yes, there’s an enthusiastic call for diverse books right now. I’m thinking of the We Need Diverse Books Campaign, and I’m seeing more diversity in our award-winners. This makes me very happy. But, we still have a long way to go. I grew up in a working class, Mexican American family, a group that is still underrepresented. Here is a population statistic from “A Demographic Portrait of Mexican-Origin Hispanics in the United States” by Ana Gonzalez-Barrera and Mark Hugo Lopez: “Mexicans are by far the largest Hispanic-origin population in the U.S., accounting for nearly two-thirds (64%) of the U.S. Hispanic population in 2012.” Two-thirds of the Hispanic population in this country! I haven’t done the research, but I’m curious. If you took all the books published by Latinos in this country, what percentage will be by Mexican Americans? So, moving in the right direction? Yes. But are we there yet? No. That’s why it’s an exciting time to be a writer and an advocate for diverse books. Do you have any new book projects in the works? Can you share anything about these projects? Right now, I’m working hard to spread the news about NOTHING UP MY SLEEVE. I like to write short stories, too, so I’m using the time between book projects to finish and polish some shorter pieces I’ve been working on. I was so excited to find out about CentroVictoria! Tell us about your work there. CentroVictoria is supported by the University of Houston-Victoria, where I work. Its founding director is Dagoberto Gilb, author of BEFORE THE END, AFTER THE BEGINNING. Our goal is to promote Mexican American literature and art. Right now, we’re doing this in two ways. One is the publication of an annual magazine called HUIZACHE. It’s a beautiful magazine, and I highly recommend it for people interested in Latino literature. Please visit our website http://huizachemag.org/ to learn more. The second way we promote the literature is to help educators. Dagoberto and his son, Ricardo Gilb, edited a textbook that was just released by Bedford St. Martin’s. It’s called MEXICAN AMERICAN LITERATURE: A PORTABLE ANTHOLOGY, a great resource for those who want a taste of important works and a sense of how the literature has changed. Dagoberto and Ricardo did a phenomenal job. For my part, I wrote an instructor’s manual full of discussion questions. It’s available as a downloadable pdf file.